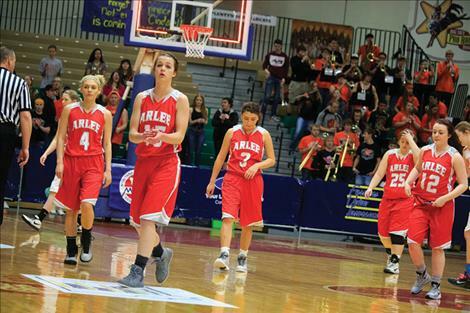 GREAT FALLS - The Arlee Scarlets started their run for the State C Title on Thursday, March 9, against Two Medicine Lake-Froid. The Scarlets took the lead in the first quarter and there was no turning back as they outscored their opponents in every quarter, except the last. Arlee Scarlet Alyssia Vanderburg was the top scorer of the night with 16 points and Becca Whitesell added 10 in their 41-37 win over Two Medicine Lake-Froid. The following night, the Scarlets played against Box Elder in the semifinal game. Box Elder came right out of the gates outscoring Arlee by 10 points in the first quarter. The second quarter was similar and the Scarlets found themselves down 22-39 by halftime. 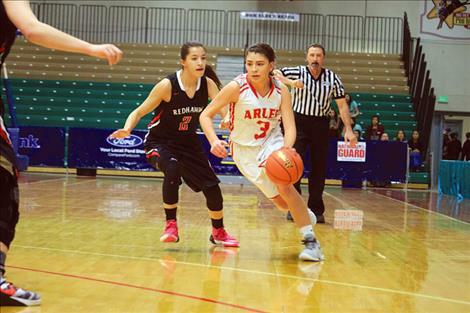 Arlee made a comeback in the second half, outscoring their opponent in the third and fourth quarters. Vanderburg scored a game-high 26 points and added 11 rebounds, but her efforts were not enough to secure the win. The Scarlets fell 60-65 and lost their chance to play in the State Championship game. On Saturday, March 11, the Arlee Scarlets took the court for the last time of their 2015-16 season playing against Plentywood in the loser-out game. Arlee took the first quarter, but it was a different story the rest of the game. Plentywood surged the next three periods and beat the Scarlets 50-38. Arlee - Points: Alyssia Vanderburg 16, Becca Whitesell 10, Bryndle Goyins 6, Carly Hergett 6, and Abby Yocum 3. Assists: Whitesell 4, Hergett 1, and Yocum 1. Arlee - Points: Vanderburg 26, Hergett 12, Goyins 10, Whitesell 9, Yocum 2, and Morgan Malatare 1. Assists: Whitesell 3, Hergett 2, Malatare 2, Shaylee Perry 1, and Goyins 1. Megan Shick 3. Assists: Malatare 4 and Yocum 1.